Aava transforms an essential and efficient form to evocative through the texture and warmth of wood. Soft curves yield a contemporary silhouette that is both striking yet sensitive, an adaptive form that can speak or assimilate to any environment. Made for both residential and contract use, Aava’s wooden shell and base are fabricated in a diverse range of materials, colors and finishes. Precompound wood skillfully milled in variable thickness and sheathed in veneer to accentuate its sinuous silhouette, its shell is available in a range of wood materials: birch painted black, birch painted white, natural birch, natural oak color, natural walnut color and beechwood. Bases include wooden legs, sled or chrome 4-legs: all with or without armrests. Chrome 4-leg and sled bases version are stackable for large-scale use and storage. A stool version of Aava is also available in two heights (65 and 75 cm). New for 2014, Aava’s evocative silhouette is now complemented by an even broader range of customizations for home or contract use. In addition to material, finish and color options for Aava’s milled wooden shell and base selections, Arper now offers a new front face upholstery choice for both the chair and stool, making seamless integration into any design project possible. A newly engineered stacking protection pad and linking system make Aava ideally suited for both large, dynamic commercial spaces and small impromptu gatherings alike while an additional desk tablet enhances Aava’s functionality. Aava transforms the essential and efficient to an evocative form. Soft curves yield a contemporary silhouette that is both striking yet sensitive, an adaptive form that can speak or assimilate to any environment. From the original wooden collection, Aava’s line has expanded to include a new plastic shell in a soft, elegant range of colors lending quiet sophistication to Aava’s fluid lines. Bases include wooden legs and a version with sled or chrome four-legs, available with or without armrests. Chrome four-leg and sled bases versions are stackable for large-scale use and storage. 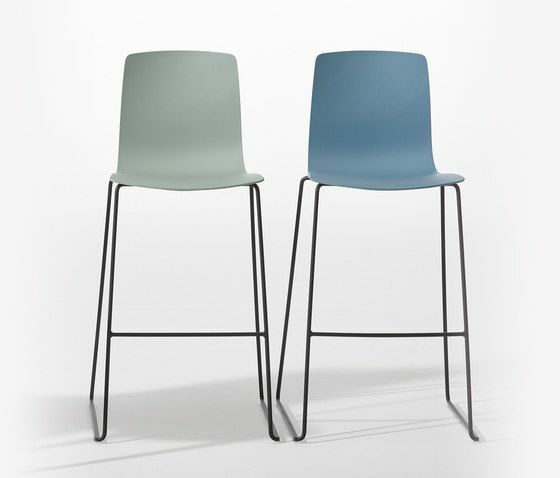 The Aava collection continues to grow with a new stool option for 2016. Available in two heights, Aava’s contemporary silhouette is now available in a wooden base that expresses the warmth of materiality. Compatible with both the polypropylene and wooden shells, the new base is available in natural birch effect, natural oak color, natural walnut color and beech-wood to match the colorways of the wooden shells. Aava can be further specified with polypropylene armrests, seat cushions or frontal upholstery for plastic shells and pads for easy stacking. Visually striking, these textures combine to create an adaptive form sensitive to any environment.